Metropolitan Transportation Authority (MTA) officials yesterday began the process of breaking through the floor of Grand Central Terminal in New York City, marking the start of construction on one of several access points that will connect the terminal to a new concourse for Long Island Rail Road (LIRR) passengers being built below. That concourse is part of the East Side Access construction project, which will bring LIRR trains into Grand Central, MTA officials said in a press release. 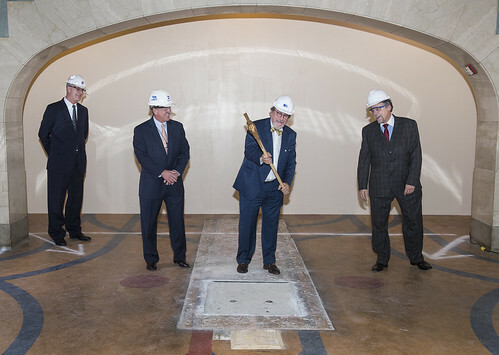 Michael Horodniceanu, president of MTA Capital Construction Co., struck the concrete floor with a pickax, signifying the start of work to remove the section of floor to make way for new escalators and stairways. He was joined by MTA Metro-North Railroad President Joseph Giulietti and LIRR President Nowakowski, along with East Side Access project and construction staff. MTA Capital Construction Co. President Michael Horodniceanu (second from right) holds a pickax as he readies to strike the floor in Grand Central Terminal. The work that began yesterday is expected to take 12 to 18 months, MTA officials said. The space that will house the stairway and escalators is a former seating area on the west side of the lower level dining concourse. A 1,920-square-foot area has been closed to the public to allow construction to take place, MTA officials said. The larger East Side Access process calls for construction of a new passenger concourse, platforms, and passageways beneath Grand Central, along with the excavation of 42,500 feet of tunnels in Manhattan and Queens. "East Side Access represents the largest service increase for the Long Island Rail Road in more than a century," Nowakowski said. "The new terminal will double our capacity into Manhattan, and give our customers a direct ride to the East Side for the first time." In February 2015, MTA awarded a $430 million contract to GCT Constructors to build the future LIRR concourse. Under the contract, workers will build the architectural, structural, mechanical and electrical facilities, and escalators and elevators that will make up the future 350,000-square-foot concourse. The completion of the East Side Access project also will allow Metro-North New Haven Line trains to access the west side of Manhattan and four stations to be build in the Bronx, MTA officials said. Revenue service is forecast to begin December 2022, according to MTA.